DAN has always been about the partnership between our organisation and the scuba divers who support it. 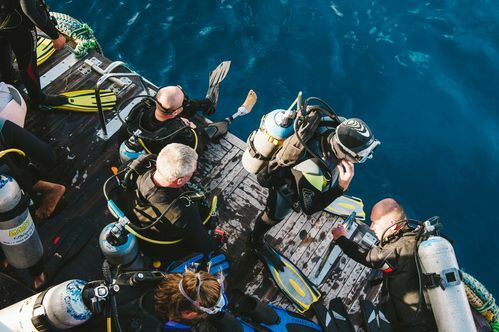 DAN members enjoy great benefits, including Emergency Evacuation Assistance, Alert Diver magazine, and access to industry-leading dive cover products. We have been visiting scuba centres in Gauteng, Western Cape, KwaZulu-Natal and had great fun at the Cape Town Dive Festival, Port Elizabeth Dive Festival and enjoyed the hospitality of the divers at the Bass Lake Ice Breaker and the HSASA Dive-A-Thon at Miracle Waters earlier this year. Why Notify DAN Before Your Dive Trip? One of the joys of diving is that it provides an opportunity to travel. The travel notification is to ensure that our team knows when you travel abroad. Your information helps us assist with fast and speedy service when you need it the most. With the information provided by you, the DAN-SA Member, we will be able to plan potential evacuation procedures and advise you on the availability of appropriate facilities where you will be diving. The travel notification only applies to active DAN members. Our top Industry Partners actively promote our cause among their dive clients and students. Well done to the following partners. Gear-up for your diving with DAN the diving industry’s largest association dedicated to scuba diving safety! The DAN Shop is committed to offering the best prices on DAN products for all divers, DAN members and DAN Industry partners at one low pricing structure. 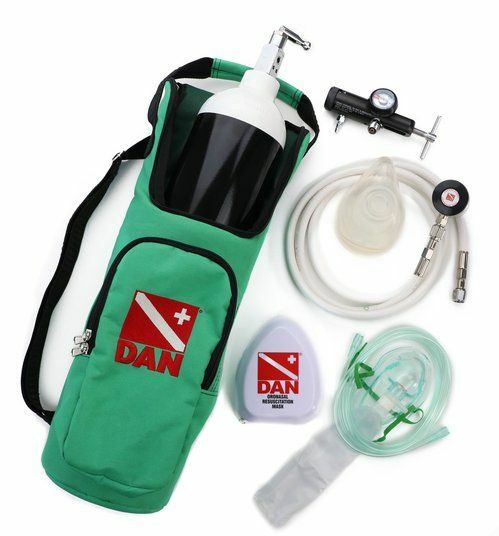 Soft Sided Oxygen Kit: The DAN Soft Sided Oxygen Rescue Kit unit was specially developed at an affordable price in an easy to use and portable Soft-Sided "Grab & Go" Bag. 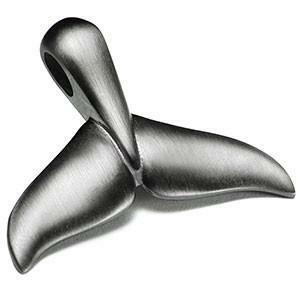 Whale Fluke Tale: The " Whale Fluke " necklace is made of Bronze (lead-free) while its coloration is obtained during a galvanic process with Ruthenium. The polishing of this necklace was carried out with Nickel free materials. 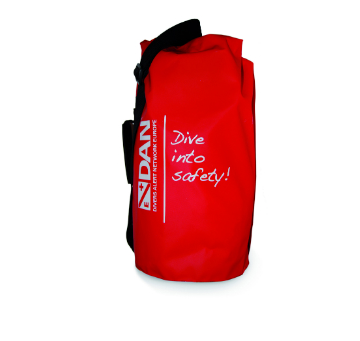 DAN Dry Bag: The handy, 15 liter dry bag with shoulder straps and handle will soon become one of your favourite bags during dive excursions. It is ideal to keep materials such as your logbook, phone, wallet or purse dry in wet environments. A white DAN logo and the slogan "Dive Into Safety!" is printed on the bag. We are amid a technological revolution. Dive computers have kept pace with the times, and yet divers are keenly awaiting medical technology developments, such as real-time carbon-dioxide sensors for re-breather diving and blood-glucose monitors for divers with diabetes. What the future holds for waterproof wearable fitness trackers is anyone's guess. This year’s Earth day celebrations around the world mainly focused on plastic pollution on land and sea. The use of plastics and dumping it in the ocean is of great concern. It is estimated that the garbage patch in the Pacific Ocean is three times the size of France. We still use single use plastic such as ear-buds, straws , shopping bags and coffee cup lids. According to a WWF-SA report released on Earth day 2018 it is estimated that by 2050 there will be more plastic in the ocean than fish. More than 80 % of plastic polluting the ocean were used by us. As divers we need to be aware of our environment for own safety and that of the creatures we enjoy seeing above and underwater. Divers are becoming more conservation conscious as they experience the oceanic environment first hand. Other concerns in our oceans include, over fishing, oil and chemical pollution, global warming and coral bleaching to name but a few. Reuse and recycle properly! When you need help call the hotline! One of DAN’s best-known resources is the 24-hour DAN Emergency Hotline, which stands ready every hour of the day to help scuba divers in need. . But DAN offers a number of non-emergency resources as well, including the DAN information line. Based on the 2018 hotline calls to-date the trend show that more divers are proactively managing their fitness to dive in terms of seeing dive medical physicians to manage their pre-existing and chronic medical conditions prior to diving or learning to scuba dive. The hotline also handled an increasing number of DAN members notifying us of their travel plans. Let’s talk fitness! In a time where we are prone to instant gratification and everything being at our fingertips, being a scuba diver, you will at some time find yourself swimming against a current, to swim to a boat on the surface. Ask yourself are you physically fit enough to help your dive buddy in an emergency? Click the links below to access more DAN fitness and diving resources! Looking forward to invigorating days of diving is sometimes the only way to get through the headache of travelling with dive gear, which can be clumsy, cumbersome and difficult to explain to airport security. For more info on how to prepare and streamline the process for your next dive trip read our smart guide to travel. As part of the DAN mission the DAN team has been hosting several of Oxygen for Scuba Diving Injuries Workshops throughout South Africa and will soon be expanding this effort into other parts of the DAN Southern Africa region. The focus of the workshops is to ensure that dive operators and their staff members are equipped to assist divers in the event of a diving emergency. Oxygen first aid can greatly improve the chances of making a full recovery for divers with decompression illness, shock or drowning. The aim of the workshops is to provide entry-level training on recognising and managing possible diving-related injuries using emergency oxygen first aid effectively. The DAN team has completed Oxygen for Scuba Diving Injuries Workshops in the following areas during 2018. In Port Elizabeth with the ProDive team. In Umkomaas with the Aliwal Dive Centre team. In Scottburgh with the ScubaExcursions team. In Shelly Beach with the Aqua Planet team. In Gillitts, KwaZulu-Natal with the Aqua Wild Africa team. In Gauteng with the Scubaversity team. Umkomaas with the Blue Ocean Dive Resort, Aliwal Shoal Scuba, ScubaCo, Agulhas House teams. In Southern Mozambique with the Gozo Azul, Back to Basics, Underwater Explorers, Scuba Adventures and White Pearl Resort teams. In Gauteng with the 7th Heaven Scuba team. In the North-West with the Mooinooi Scuba Club team.